Hello everyone and welcome back to my blog! 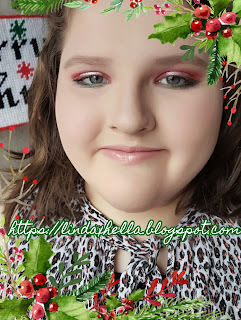 Today I’m sharing with you this festive Christmas makeup tutorial. It should have gone up yesterday, but I’ve been very sick. I couldn’t even do my own makeup. My eleven year old daughter thankfully let me do the makeup on her! Now I know she doesn't need makeup, she’s still young but she loves playing with it sometimes too. A few hours after I did her makeup, her and her dad went to a Christmas dinner at his dad’s. I sadly had to stay home. Yay for being sick, lol. Let’s get right into this tutorial! 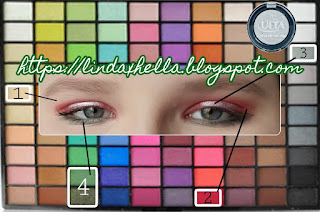 For this look I used all drugstore items! Apart from an ulta shadow, but they’re drugstore priced. The eyeshadow palette I used today is an Elf 100 piece palette I got a few years ago. I think they bring a variation of the same palettes out every season. To start out this look I primed her eyelids and set them with a cream color shadow. I took a flat shader brush and dipped into the Red and started patting it and blending it across the lid. Sadly it was not showing up red. So I took setting spray and packed it on, which worked thankfully! To soften the crease edge, I took a clean natural fiber blending brush and went back and forth till it had a softer fade. For the center of the lid I took more primer just on the center and patted on the silvery gray color. It didn’t have the pop I was looking for, so I took a wet brush and picked up Ulta’s Glitter eye Top Coat in Put a Ring on It (silver) and patted it over the gray and it worked out so well! For the rest of the look, I did the rest if the face makeup and finished by taking a dark green on the outer half of the bottom lash line and a brighter green on the inner half, blending them into each other! That completed the look and it make her eyes pop! Thank you so much for checking out this tutorial! I hope you have a very Merry Christmas, if you celebrate that is. Or just have an amazing Monday! Let me know how your day was and how you liked this tutorial. As always, tools, products and social media links are all below!